I love the look of these fixtures plus the reflection of the light on the ceiling is an added bonus! They are very good looking and brought my hallway up to date. I had them installed by a professional. 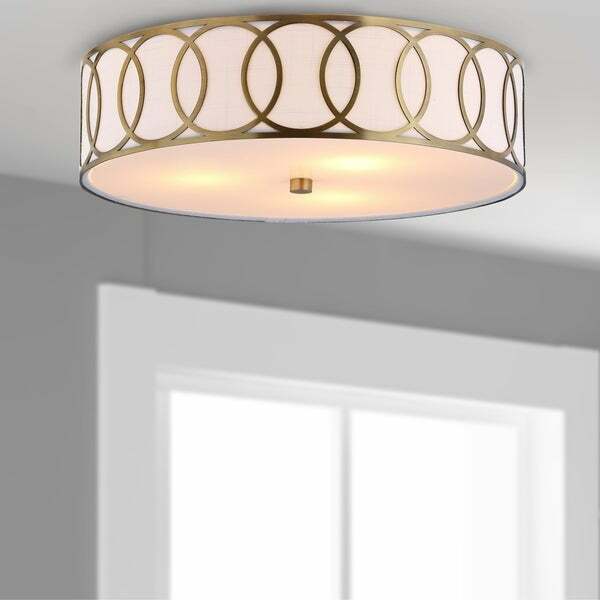 Tie your contemporary space together with this sleek flush mount by JONATHAN Y. The brass-finished metal frame features a circular fretwork design over the white cotton hardback drum shade. Three LED bulbs are included for eco-friendly illumination. Gorgeous light fixture! This flush mount light will make a huge impact in the entryway of a house I'm renovating. I can't wait to see it installed, but it looks beautiful in the box. This light fixture is absolutely beautiful! Shipping was fast and assembly was a breeze! I would recommend this fixture. I’ve already received so many compliments on it! Stunning! We love the warm light that these flush mounts provide in our master closet, while adding a touch of glam (but not overboard for the hubby!). Very pretty and easy to install. We purchased two and couldn’t be happier. Thank you Overstock for the competitive pricing and excellent customer service? The light fixture is very attractive. We did have trouble with the install as the screws provided are very short and we were having trouble getting them to line up with the metal bar in the ceiling. My husband improvised and was able to successfully get it installed. If you look close at the "gold" it isn't perfect but for the purposes of a ceiling light, it looks very good. We had a second one to hang in another area and decided to return it due to the difficulties in installing the first one but are very satisfied with the look and light provided from the one we did install. Beautiful light fixture I ordered this light for 1st fl. hallway now ready to order for upstairs hall I love this light, give the area that look, of perfection! I love this light fixture. It’s pretty when lit and off! This is the perfect addition to my walk in closet. The gold goes with the other accents in the room. I looked for a while but when I spotted this fixture, I knew I had to have it. We are building an addition so it won’t be installed for awhile but it arrived quickly, is packaged well and looks as pictured. I can’t wait to put it in my new bathroom. I just installed this light fixture and it’s absolutely beautiful!! Great low profile look I was wanting for an interior hallway. Mounting design not great, was quite challenging to install and I have a good deal of experience. I needed a flush mount fixture and I thought this is pretty.